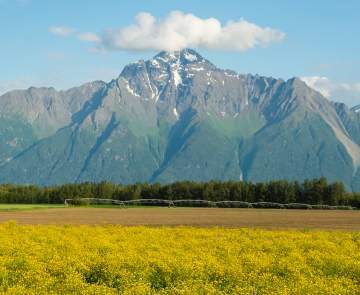 The Old Glenn Highway is a delightful 19-mile country road that cuts through the heart of the original Matanuska Colony Farmlands and provides a scenic alternate route between Anchorage and Palmer, Alaska. Depending on stops and activities, this self-guided drive can be accomplished within a day. From Anchorage: Follow the Glenn Highway approximately 30 miles north and watch for exit signs to the Old Glenn Highway. From Palmer: Follow West Arctic Avenue through town and watch for signs. Driving from Palmer, travelers first encounter the Matanuska River Park camping and day use area with picnic pavilions, fireplaces, tent and RV facilities, hiking trails, playground and more. This is a great spot for a picnic lunch and for the little ones to burn a little energy. Lazy Mountain Recreation Area is an excellent day hike. Turn east on Clark-Wolverine Road to the parking lot. From the base, this challenging 2.5-mile trail ascends over a well-trodden path straight up the mountain. About a third of the way up, the slope is gentler and the landscape changes from forest to rocky tundra. After a few false summits, the final vantage point offers great views of Matanuska River, Pioneer Peak, and Cook Inlet. Pet, photograph, and hand feed Alaska reindeer at the Reindeer Farm on Bodenburg Loop Road. View moose, black-tailed deer, and elk. This stop is perfect for kids of all ages! The Bodenburg Loop Road area also has some of the original Matanuska Colony Farms. In 1935, during the Great Depression, President Franklin Roosevelt sanctioned a program to relocate 203 farming families from the Midwest to Palmer. Parcels of land were distributed to the "colonists" by lottery. Back on the Old Glenn Highway; continue west for about three miles and cross the Knik River. Pioneer Peak and the Chugach Mountains dominate the view. 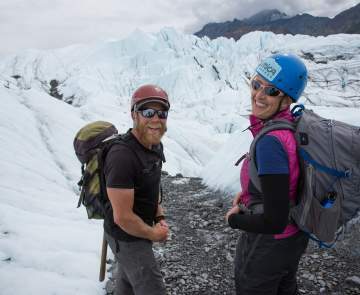 As you cross the river, turn onto Knik River Road, an 11-mile gravel road where hiking and ATV trails, camping and views of Knik Glacier are available. Boat and ATV Tours depart daily to the face of this magnificent Alaska glacier. 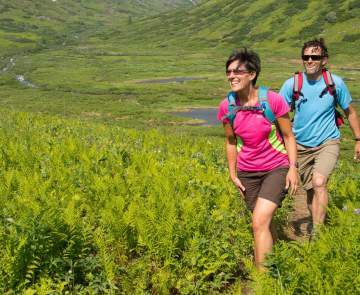 Overnight at Knik River Lodge or return to the Old Glenn Highway, travel west along the mountains to the Glenn Highway (Alaska Route 1) and return to Palmer or head south to Anchorage.